The Trulli are not quite as large as they may appear in the photos. They have been nick-named "Dwarves' Cathedrals". This picture will give you an idea of scale, I am 5' 8½" (174cm). We have a habit of buying old houses with small doors. The door into the bathroom is 65 in (165 cm) and into the middle Trulli (illustrated) only 59 in (150 cm). A couple of times I have gone to the bathroom for a pee in the middle of the night and staggered back to bed clutching my forehead and muttering, "Ow! Ow! Ow! That hurt!!" I am still learning to duck walk like Groucho Marx. Avon Cottage holds the record though, the door into the third bedroom is only 44 in (112 cm) high by 22 in (56 cm) wide. This is because the room is converted loft space and the door is squeezed between the oak of the cruck frame and the brick of the chimney. Not surprisingly it is a favourite with visiting children. 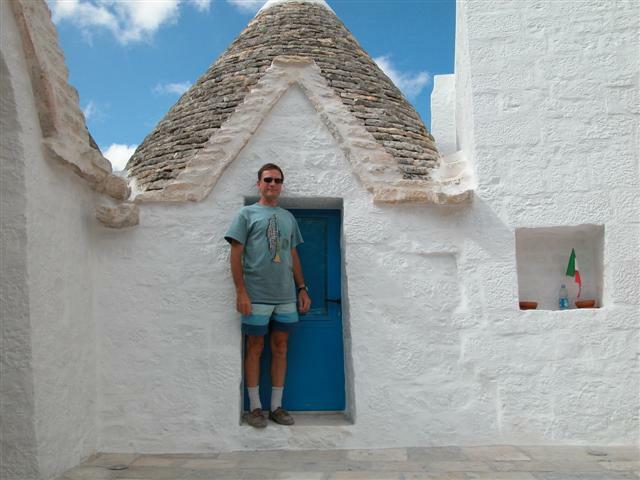 In Puglia the door size is as much a function of the local population. Here in Southern Italy, Mary and I tower a full head above half the people at the local market. Mary's height, pale Scottish complexion, freckles, blue eyes and blonde hair attract a number of curious stares. If, as they often do, guess us as German, Mary corrects them in Italian "Sono Scozzese" (I'm Scottish). I wouldn't have a prob with the height--always the width I worry about! ha. How charming.